I've had a good week. I ran 10 miles last Monday, as I mentioned in my previous post. The furthest I have attempted since my knee operation. On Wednesday I ran 10k, and on Thursday I ran my 3 mile tempo run. I can gauge my fitness off this 3 mile run alone, and for the last 3 weeks I've been struggling to improve. This week I did manage to make a positive improvement. I averaged 7:18 minute miles for the course; which is a 1.5mile out and back. The out is a steady uphill, and 1.5miles back down of course. Now, this is still a long way off 6:50 minute mile average which I have done previously, and I think I could improve that further too. However, completing the 10 miles, and seeing an improvement in my fitness on the tempo run gave me some measure of confidence going into this weekend 27 mile Harden Hard'un. I ran this event for the first time in 2007. I carried a 7kg pack back then, trying to simulate race conditions on the marathon des sables. I completed the event in 6hrs 36. I took part a year later in 2008, after completing the marathon des sables. This time I didn't run with a substantial backpack, just a camelback of water. The weather in 07 and 08 was cold and wet, and as a result the moorland was very boggy and slow going. So, I managed to complete the event in 6:06 in 08. This year, I had no aspirations of completing the event in that kind of time, I just wanted to see if my knee would carry me through 27 miles at all. Below is the route, elevation and my pace. Note the speed profile stops before the end, you'll read why later on. 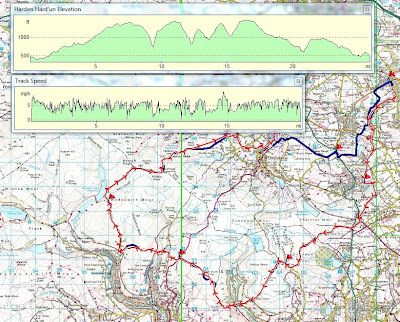 The event has around 4000ft of ascent and around 50% of the course is open moorland. The weather this year was very nice. Sunny in the morning, and overcast in the afternoon. The ground was dry, perfect conditions. I drove to Harden, near Bradford in Yorkshire and registered for the race. Just before the start I realised I had left my GPS watch in the car, so I jogged round the corner and collected it. Too late, the race started, so I patiently waited for the first 20 or so runners to pass me before joining them. I set off at a deliberately conservative pace. There is a gradual ascent for the first 8 miles, and this section of the course I knew so well I didn't even use my PDA/GPS. I just took a cupful of water at CP1 (3 miles), and was on my way within a few seconds. A few who had stopped at the CP, overtook me again soon after, but I remembered some of the hills were tough, so I continued to pace myself carefully. The first moor section is a mile or two after CP1, just after the farm track picture below. The ground on the moor was very dry; very little mud at all. I ran past the windfarm on the way to CP2. The second checkpoint was at just over the 7 mile mark, and once again there was a little group of perhaps 7 or 8 people that set off just ahead of me. I grabbed a small piece of fruit cake from that CP, but no water. I was carrying 1.5l of Perpeteum in my camelback, and still had plenty. Straight into the main moor section after CP2, a section which I remembered from previous years being ankle/knee deep bogs; not this year, all dry. Around here the route levels out before a sharp descent into Luddenden Dean. There is however a nasty climb back out, on a dirt stair-case. It was on the climbs when I really noticed my left leg being well down on power. My quad muscles are still visibly smaller on my left leg, and it feels like I am simply climbing with my right left, and dragging the other left up. Hopefully this will improve in the next few months. I took this photo when I had already climbed about half way up. You can just make out two people ahead of me, near the top. It's a climb of 700ft in about a mile. At the top there is then a gradual climb, over some slightly poorer terrain, not all of it easy to run, up to a trig point and then down to CP3 and 11.5 miles. The organiser Peter, recognised me and asked how I got on at the MDS, so I stopped for a few mins to have a chat. After that I set off again on a downhill section to Crimsworth Dean. I felt a little sick at this point (12 miles), and a little low for some reason. It was one of those time on a race when you question why you are putting yourself through this needlessly? Anyway, I know how these phases come and go. There is another sharp climb out of Crimshaw Dean, followed by a sweeping half-descent into Walshaw Dean, and then yet another stern climb up and over Deans Gate to CP4 at almost the 15 mile mark. I had caught up a couple who were running ahead of me, but they carried on as I chatted to the people at CP4 for a few mins. I recognised them from previous years. They always get landed with the most remote CP it appears! They serve very welcome oranges to refuel on, and were thankful the weather was warmer this year. maps and carried on, ignoring me? Well, I didn't see either the two people who were ahead, or the couple behind ever again, so they either got lost or tired out. I headed down onto Hawarth Moor, feeling stronger now (18 miles). It's strange I always seem to feel stronger as I approach the 20 mile mark in a race, just as other are flagging. I think it's just good early pacing, nothing magic. I saw 3 people about a mile ahead, but had almost caught them up as I reached CP5 at 19 miles. They didn't hang around long as they saw me coming up behind. I had to stop to refill my camelback, this time with some orange juice from the CP. I took a square of cake to keep my carbs topped up and headed out a couple of minutes behind them. I caught them about a mile later, as one of them was suffering from cramp. My right calf was just thinking about cramping when I ate some of my rescue Pop-Tarts, and that seemed to sort it out. The three were running just ahead, but took a wrong turn. I shouted them back, and put them on the right path but now headed off ahead of them. I glanced at my GPS as I had heard a low battery warning. I had forgotten to turn off the auto-dim on the screen, it appeared. I memorised the way to the last CP, 6, just before the battery died. That is why the speed profile on the map above stops after 20.5 miles. Just before CP6 there is a short road section, and it was evident I was feeling strong because I really stride out at quite a pace all the way there. I got the CP (23 miles), but they didn't have a spare route description, so I had to sit and wait for the 3 people behind to catch up and then had to tag along at their pace as they had the directions. This was a little frustrating, but it was my own fault! I had a chat to them anyway, as we made our way towards the finish, passing Hewenden Viaduct. It looked as though I wasn't too far away from completing the event in 6:06, my time from last year, rather surprisingly. I wondered if I could do it quicker, but only if I could run on ahead. I stayed with them until about 1.5 miles from the end, when they gave me enough directions to find my own way, then shot off like a scalded cat to try and beat last years time. I ran the last mile very quickly indeed, and finished in 6hrs 02, quicker than last year by 4 minutes! It's not a race as such, but I probably came in around 10th? This was mainly due to the perfect conditions underfoot, and not any fitness improvement. My knee should be fine by next year, so I should have no excuses not to put in a sub 5:30 time. (The winner this year did it in 5:06 I believe). There was a meal at the finish, as always, but I thanked the organiser and headed straight home. A big thank you to all the organisers and checkpoint staff, all of whom were fantastic again. I can't recommend this event enough. See you again next year. So, I was very pleased to complete this event, and know that I am definitely improving. I am still well down on power on the left leg, but I can still make the distance. Edit: In 2011 I managed 5:37. Lost time waiting for CP1 to open (we beat the organisers to the CP) otherwise I would have bagged that sub 5:30! There's always next year.